There are no classes scheduled this week. Thursday is the summer's last open sew, from 10:30-1. The new Fall Class Schedule is up! You can view the classes page here to get all the info you need. As I complete samples of the class projects, more pictures will be listed. Sunday was our first ever Create and Donate! There will be 4 Create and Donates this fall. Sunday, December 14, fleece beanie. Visit the classes page to get all the info and learn how you can get involved. The first set of kits is at the Shoppe! Bib kits arrived this week and I'm excited to see what people think of them. 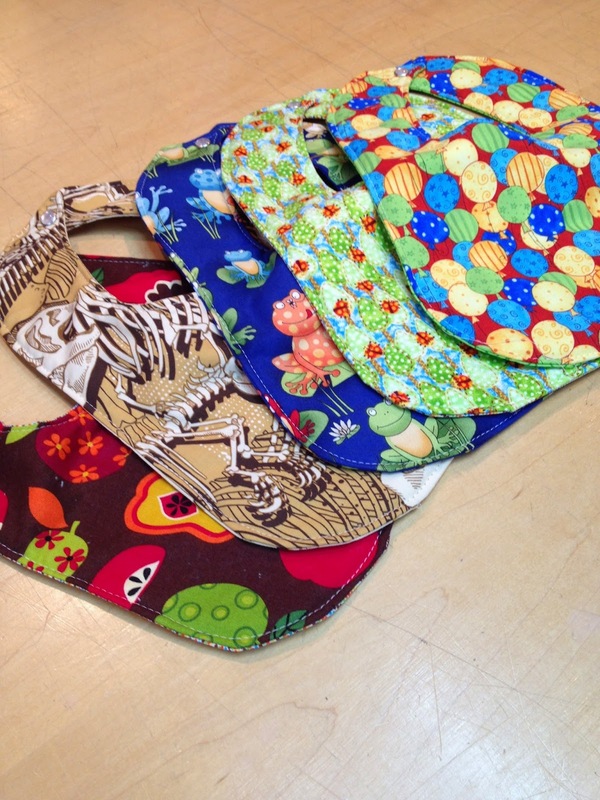 In each kit has material, batting and snaps to make one infant bib. There is also a coupon for the bib pattern available in my etsy shop. 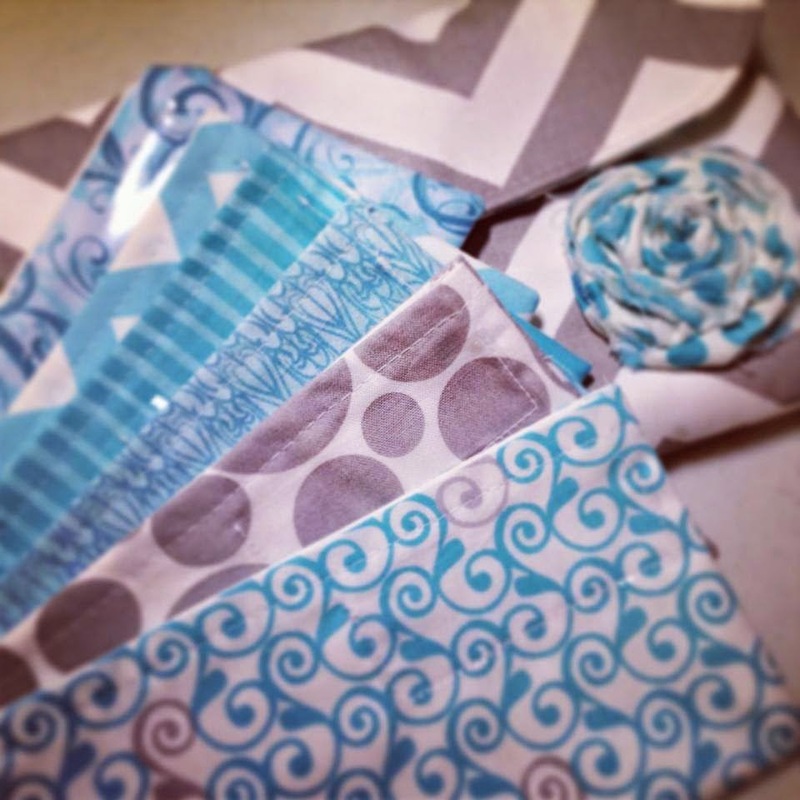 If you're coming to class but don't want to run all the way over to the fabric store and spend time matching fabrics or having to buy a whole roll of batting for just one small project - I think you're going to like the idea of these kits. More to come! Anyone who follows me on Facebook knows that I do more work with cash envelopes than anything else. But there are still lots of people who look at me funny when I tell them what I do. What is that? What do you do with it? People still use cash?! Clearly, lots of you do! And I thank you for it. This week I'm working on one with 20 inner envelopes...it's the biggest in DLD history. In honor of all you cash envelope users, we're having a contest this week. Post a picture of your cash envelope in use right up there on the DLD Facebook page. How did you label your envelopes? Do you use it as a wallet or as longer-term saving? Is it for birthdays, holidays, receipts, coupons? We want to see! Pictures will be accepted all this week, until Friday, August 22. Then I will make an album of all the entries so we can vote for our favorite! The person whose system earns the most likes will win a set of three specialty envelopes: Christmas (or other holiday), birthday and travel. Good luck! PS...the etsy shop will be on vacation next week, August 24-31.